The five star Evason Hua Hin & Six Senses Spa is located in the quiet area of Pranburi to the south of Hua Hin and provides calming views of the Gulf of Siam. 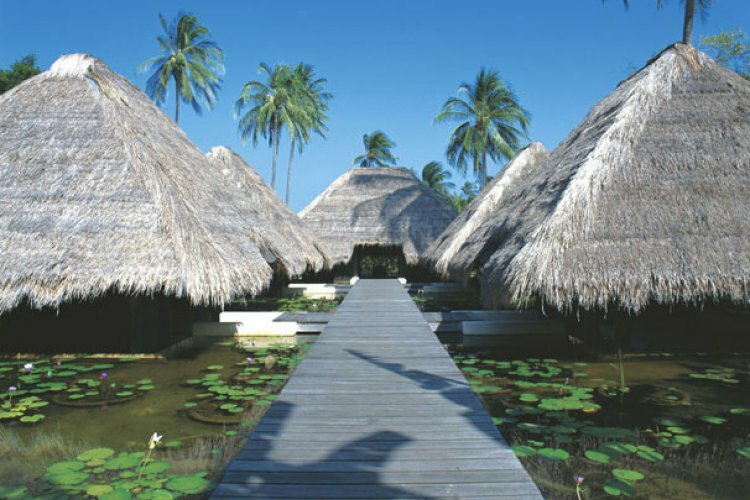 The hotel is set amongst 20-acres of landscaped lush tropical gardens with lotus ponds. Despite the hotels secluded location, a short 5 minute drive will take you to the many attractions of Hua Hin itself. With 185 luxurious rooms including 40 private pool villas, the Evason Hua Hin & Six Senses Spa offers first class accommodation throughout.. Most rooms have bright, open-style bathrooms so as to create more space and light in the room and all have modern amenities. Guests staying at the Evason Hua Hin & Six Senses Spa enjoy a good choice of dining options. Chose between classic Thai or western, or head for the seafood beach restaurant with its wood-fired pizza oven. The Evason Hua Hin & Six Senses Spa offers guests a wide range of activities including a a super pool, sailing, windsurfing, tennis, bicycle and kids club. Not forgetting the wonderful Six Senses Spa where you can relax and enjoy a variety of therapeutic treatments and massages. A great hotel - the only comment is that we felt that they should have had different menus for lunch and dinner as the food became a bit boring after a while. Especially as there is not much to do in the area. Good News! There are 15 suppliers who can supply prices.